Welcome back to another edition of Team Santa Inc. News Daily. Today we have a treat for all the decorators out there who have a penchant for hanging string lights. 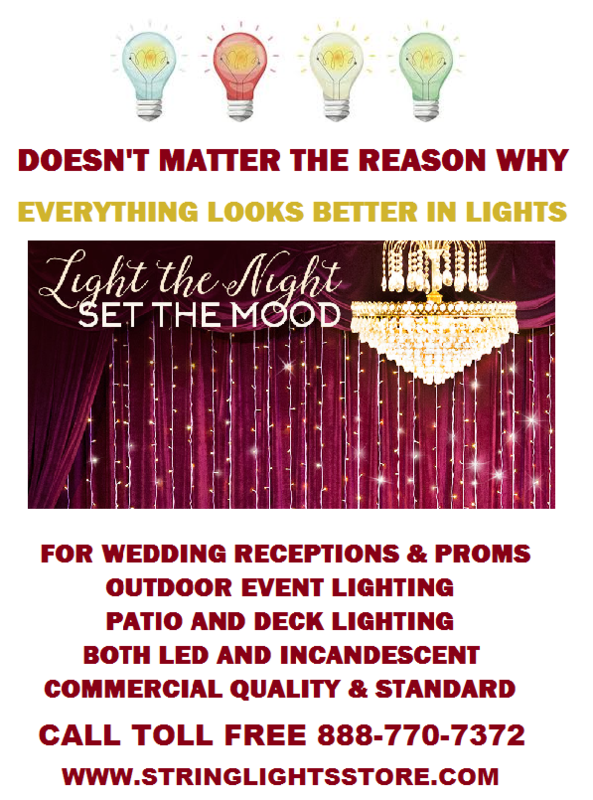 Whether it’s for a wedding, prom, Christmas, Halloween or other type of indoor or outdoor event, the String Lights Store has all the string lights you could ever need to brighten up any celebration or gathering. LED string lights are all so popular these days because they look a heck of a lot nicer than the old fashioned Christmas lights. In the old days string light manufacturers would paint the bulbs to arrive at the desired color. LED string lights changed all that. Now it is the LED that generates the color giving you a more vibrant hue and a brighter string lighting display. LED string lights consume approximately 20 percent of the energy required to operate standard string lights. So LED string lights pay for themselves over the time that you use them. You will see the savings on your electric bill. Another fun fact about LED is that you can connect what is seemingly an unlimited amount of string light sets together in a effort to create one long string. This makes perimeter lighting and large projects a cinch because you can have the length you want while not having to utilizer more than one electrical outlet at a time. This feature is also ideal for tree trimming, thus allowing you to continuously go around your tree until you are satisfied with the number of lights on the tree. If you’re in the market for string lights, come by the String Lights Store and see for yourself. Tight on money? No problem, at the String Lights Store you can haggle the price lower if you should so desire. I will be back tomorrow with another edition of the Team Santa Inc.‎ News Daily. Keep it here for the latest and greatest when it comes to decorating for the holidays or an event. Would you like some personal attention? Send an email to support@teamsanta.com and let Team Santa Inc. treat you like family. They really will. Speedy same day shipping on most items.